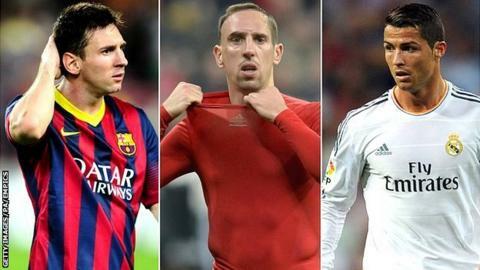 Cristiano Ronaldo, Franck Ribery and Lionel Messi are on the three-man shortlist for the 2013 Ballon d'Or. The trio were chosen from the 23-man list, which included Gareth Bale, and the world player of the year will be revealed on 13 January. Barcelona's Messi has won four years in a row but Real Madrid forward Ronaldo is the favourite to win this year. The women's final trio are Nadine Angerer (Germany), Marta (Brazil) and Abby Wambach (USA). Fifa has also confirmed the final three for coach of the year - with former Manchester United boss Sir Alex Ferguson vying with ex-Bayern Munich coach Jupp Heynckes and Borussia Dortmund's Jurgen Klopp for the award. The winners, to be announced at a ceremony in Zurich, will be decided by a vote among the captains and head coaches of all Fifa-affiliated men's national teams, as well as by international media representatives selected by France Football magazine. France Football introduced the Ballon d'Or in 1956 to honour the European footballer of the year, with England's Stanley Matthews the first winner. In 2007 the award became a world player award and three years later it merged with Fifa's own world player honour. Barcelona and Argentina forward Messi, 26, has won every year since the merger, but Real Madrid and Portugal star Ronaldo, 28, emerged as the bookmakers' favourite after his fifth hat-trick of the season sent Portugal to the World Cup at the expense of Sweden last month. Bayern Munich and France winger Ribery, 30, had previously been considered a leading contender after winning the treble with his club last season. Hours after the Portugal-Sweden game ended, however, Fifa extended the voting period from 15 November to 29 November after saying fewer than 50% of eligible voters had responded before the original deadline. Aside from Bale, five other Premier League players failed to make the cut from the initial 23 - Arsenal midfielder Mesut Ozil, Chelsea forward Eden Hazard, Liverpool striker Luis Suarez, Manchester City midfielder Yaya Toure and Manchester United striker Robin van Persie. Wolfsburg's Ralf Kellermann, Germany boss Silvia Neid and Sweden coach Pia Sundhage are the final three for the women's coach of the year. Fifa has also confirmed the final nominees for the FIFPro World XI 2013, a team of the year. The British candidates are England defenders Leighton Baines and Ashley Cole, midfielder Steven Gerrard, striker Wayne Rooney and Wales forward Bale. The other Premier League nominees are: Chelsea's Petr Cech, Branislav Ivanovic and David Luiz, Manchester City's Vicent Kompany, Pablo Zabaleta, Toure and Sergio Aguero, Manchester United's Nemanja Vidic and Van Persie, Arsenal's Ozil and Liverpool's Suarez.